Your first step to creating perfection on all paint finishes! When used with an Orange Light Cutting Pad, swirl marks and other imperfections are removed with ease! In 2005, Mercedes Benz started using a nano, ceramic particle, clear coat and in 2006 domestic automakers started using a super-hard, scratch-resistant clear coat developed by both PPG and BASF. These new clear coats are scratch-resistant, not scratch proof. They can still be scratched and spotted. The problem is polishing, or removing defects, in these new, super-hard clear coats. Conventional polishes may not have the cutting power to remove swirls, spots and defects in these new coatings. BLACKFIRE Compound is designed for machine application with either a dual action or rotary/circular machine polisher. Most 2,000 grit and deeper swirls, scratches, spots and defects in ceramic particle and scratch-resistant clear coats cannot be removed by hand. BLACKFIRE Compound provides the muscle needed to level imperfections in all types of paint. To stay on top of paint innovations, BLACKFIRE incorporated cutting edge German abrasives to develop a compound and polish to remove defects in the new nano ceramic particle clear coats. This new breed of polishes is currently used at the OEM level in various auto manufacturing plants worldwide and they are considered within the polishing industry to be the most advanced polishes in the world. The result of the this German-American collaboration is BLACKFIRE Polish. This formula offers the do-it-yourself, enthusiast the ability to create a truly eye-popping shine! It restores gloss to ceramic particle clear coats, scratch resistant clear coats, as well as in more traditional single stage and two stage paint systems. Flawless paint starts with BLACKFIRE Compound! Work out of direct sunlight. 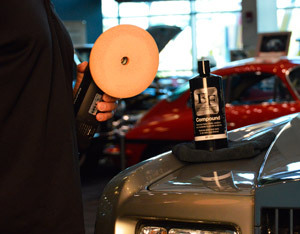 For best results by hand apply BLACKFIRE Polish a microfiber applicator or foam applicator pad. Apply a nickel-sized amount of polish to the applicator and work one a 2 sq. ft. area at a time, using short firm strokes until the polish begins to dry. Buff off residues with by hand using a microfiber towel. For best results by machine polisher, apply with a polishing or finishing pad using a dual-action orbital or rotary polisher. Polish areas approximately 2 sq. ft. in size using moderate speed (speed 4-5 on a dual-action polisher or 800-1,000 rpm on a rotary polisher) working in overlapping passes until the polish becomes clear. Hand buff residue with a microfiber towel. Follow with BLACKFIRE Paint Sealant for an intense shine!